The following steps describe what happens in the long waiting period many of our submitters experience before hearing back. A lot of people have questions about what Metonym’s process for going through submissions is, especially if they are early birds and submit their works in April or May. Below, you can find a short description of how we read through each piece and discuss most of them with our staff before fully committing to a work. 1. Metonym meets up in late August to start filtering through pieces. Because we are an undergraduate college course, the students are not all in one place until the semester begins. 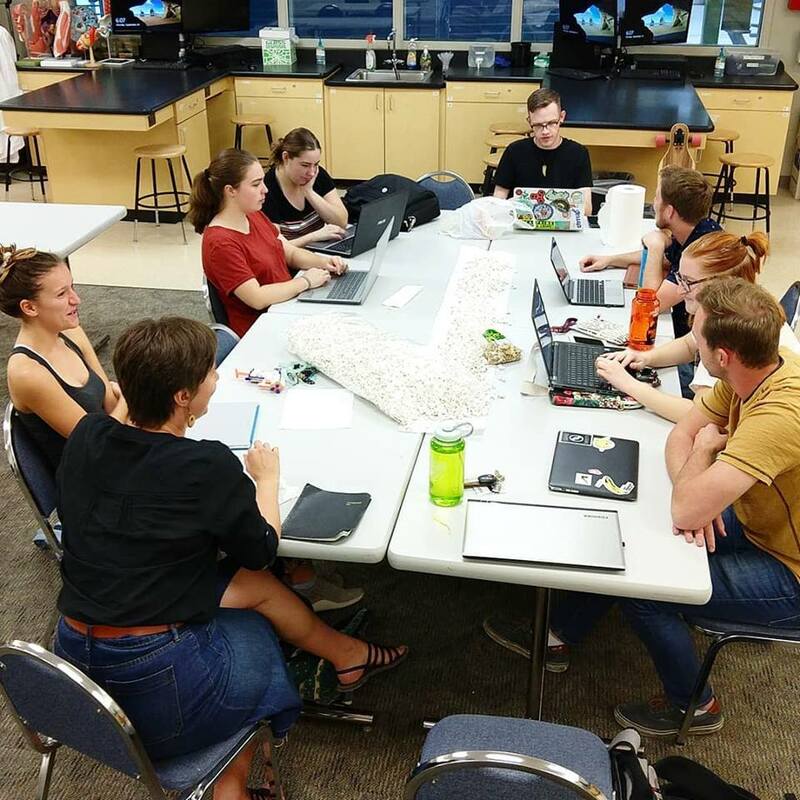 Once class begins in late August, students are assigned to the prose or poetry team. Both teams have a significant reading load, and students are expected to thoroughly read and comment on each piece. At this point, our pieces have been converted to a file that discloses no information on the author other than first and last initials to prevent any bias. 2. Pieces of intrigue are brought to the whole staff. Here, students bring their favorite works to class for others to comment on. They can be either thought-provoking, well-written, or both, and then the student makes a case for why the piece should be in the journal. Others can present counterpoints and different views of opinion. Every person on staff then attributes their vote in numerical form on the piece, and votes are recorded in a document. Much of this is fueled by snacks, as seen in the photo. This happens from early September to mid-November, even past our submission deadline due to backlog. 3. The highest-rated pieces are revisited. Generally, there will be about 50 pieces that make our cut-off. In mid-November to early December, the staff then cuts that number down. The number of pieces varies depending on prominent themes, but the recent trend has been to stick to around 30 pieces. In order to do so, each staff member is tasked with making a list of their favorite pieces and bringing up why each piece should remain in the journal. Sometimes, beautiful works do not fit into our theme, and despite our sorrow, we must say goodbye to them. 4. Each work is ordered into the journal, and acceptance and rejection emails are sent out. This next step is usually done by the core editors on staff: Every poem, prose piece, and work of art is read and viewed multiple times over yet again. Then, the pieces that have made it thus far are printed out and physically ordered until we complement every work in the whole journal. Compared to other steps, this is the shortest, though it does still take some time in mid-December. We pore over each work and make sure that its neighbors on the page support it. If we cannot find a proper home for a piece, we do our best to honor it by allowing it a better chance elsewhere. Once the order is set, acceptance and rejection emails are sent out. We hope this enlightens you on the first few steps of the journey to publication. Coming up in the next couple of weeks, we’ll have another blog post on the creation of the physical journal through graphic design and editing. Let us know in the comments if you want to know anything else about Metonym or its process.